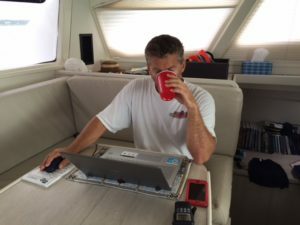 Being new to the boating world, we have so many things to learn. One common problem for people who live aboard is how to keep fresh fruits and vegetables when they travel to remote areas. Without access to grocery stores, it’s a real problem. My initial thought of the tropics was that fresh produce would be available year round, however many areas have very little arable soil so agriculture products are often shipped in. When we do come across a well-stocked store, it’s often difficult (read – painful) to justify spending crazy amounts for fresh produce that is really inexpensive back home. John and I love to eat well, so for us this was a very real concern. We’ve had a lot of great ideas from fellow sailors, and one tip which I was quite skeptical about, was how to keep fresh citrus. One friend who sails on Crystal Blues, explained that she tightly wraps fresh limes and lemons in tinfoil and keeps them in a hammock. She said we may lose a few but for the most part, they will keep for up to 4 or 5 months! I was shocked and I must admit, a bit disbelieving…but decided to give it a try. We found a couple galley hammocks at West Marine, (although bigger ones can be found on Amazon for less money). I then purchased aluminum foil sheets at Costco, along with their very inexpensive lemons and limes (approx. 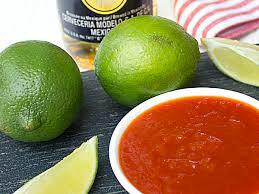 30 limes for only $6). This is the hammock hanging in our spare head. Well, I’m happy to report that it’s been 5 weeks now and we still have fresh green limes and yellow lemons! So glad we tried this trick. For the fruit to stay so fresh even after a month was a blessing. Another bonus of this approach is that it saves us valuable space in the refrigerator. In the picture below, the bottom drawer is our fridge and the top drawer is our freezer. Yup – that’s it…one small fridge drawer. Much different than our most recent house in Ottawa with 2 full-size fridges plus a stand-up freezer and full-size wine fridge. 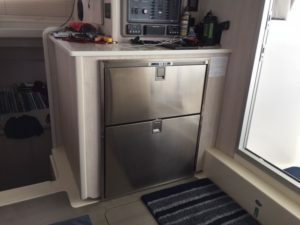 Although we were wise (actually John was the wise one) when we realized the limited fridge space on our boat, and bought a plug-in Dometic cooler that we keep on our back deck to store drinks. The cooler is really convenient, frees-up limited fridge space and eliminates the need to constantly open the fridge for drinks which lets all the cold air out. This is important when you’re relying on batteries, solar power and a diesel generator for your electricity. Since most of the places we visit will be hot and humid, it’s especially difficult to keep fruit from quickly turning bad. A great website that many people recommend is The Boat Galley, created by Carolyn Shearlock. She shares an immense amount of knowledge about how to handle a wide variety of issues in the galley and beyond. 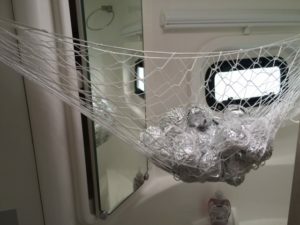 Before I learned the tinfoil trick, we were living onboard our boat in Florida and I had a bag of limes that was quickly going bad. Another friend suggested squeezing the lime juice into ice cube trays and freezing them. This has been absolutely brilliant! Now John has a fresh lime-cube to enjoy with his…whatever he’s drinking that day. I learn many valuable lessons every time I read your updates. So pleased to read that the limes in foil is working for you. We are also eating those very same limes that we bought in Costco together.